DORINGER MANUFACTURING CO. offers the finest quality of sawblade resharpening and retoothing service. We have the most modern automatic sharpening machines and factory trained operators. All sawblades are resharpened in-house, never contracted out. U.P.S. the sawblades to us, we have a 2 day turnaround, and we will U.P.S. the blades back to you. We have a free pick-up and delivery service for customers in the greater Los Angeles and Orange county area. We invite new customers to try our sharpening service. Call factory for free resharpening offer. You’ll notice the DORINGER difference. As of 2017, Doringer has added a LOROCH Evolution K850-M CNC sharpening machine to the three TEMPO ECE 45 CNC sharpening machines. 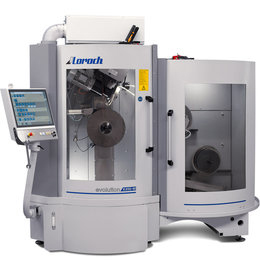 The LOROCH machine, featuring a robotic sawblade feeding system, retooths, sharpens, and chamfers the sawblade. Our new Sharpening Department guarantees one day turn around on sharpening. Customers ask: “Will a DORINGER resharpened sawblade perform as well aa a brand new sawblade.” A DORINGER resharpened sawblade will perform better than a brand new sawblade. We invite new customers to try our sharpening service. Call factory (310-366-7766) for free resharpening offer. You will notice the DORINGER difference. GENUINE DORINGER Sawblades are manufactured of Super High Speed Steel, heat treated and hardened to 63-65 Rc. Every DORINGER sawblade is individually hammered and inspected to guarantee minimum run-out with-in German DIN standards. Each sawblade has a black oxide coating, vapor treated to insure maximum coolant coverage, longest blade life, and maximum performance. GENUINE DORINGER Sawblades are the finest cold sawblades manufactured anywhere in the world. Let the saw do the work. Do not pull down too hard on the handle. Too much pressure increases chattering and vibration and decreases sawblade life. Make sure sawblade is tightly secured to main spindle (left-hand thread). Make sure material being cut is tightly vised in saw. When cutting non-ferrous materials, cut at the highest available speed, using largest diameter available sawblade, with one level coarser that above recommended chart. When cutting stainless or alloy steels, cut at lowest available speed, using smallest diameter sawblade, with one level finer that above recommended chart, and enrich coolant. When straight cutting square tubing with a seam, set the tube with a seam in a vertical wall. Always saw thru the thinnest part of the material. For example when sawing ½” by 3” flat bar, stand it up. Place angle iron in a teepee not an L.
ORIGINAL DORINGER H-32 Coolant was developed and is manufactured specifically for chip making machinery and cold sawing. H-32 is a synthetic coolant offering maximum lubricity and cooling quality. The coolant conducts the heat of sawing keeping the sawblade cool to ensure maximum blade life, and keeping the work piece cool ensuring no distortion, discoloring, and ease of handling. The synthetic H-32 requires no degreasing. Mix coolant with water 10:1 for light cutting, 5:1 for heavy cutting. Check with factory for proper ratios for other applications. E.P.A. approved. MSDS provided with each order. 1 & 5 gallons shipped UPS. 10", 11", 12", 13", 14", 15", 16", 17", 18"